“Ultra-Processed Food,” as you might guess, is a step beyond processed food. It’s not a term I just made up. It’s the result of a new effort to drill down deeper into the whole subject of processed foods, and establish a sort of rating system. It turns out that foods described as ultra-processed make up 58 per cent of the energy intake of the average American, yet the health effects of consuming foods of this type are largely unknown. The new food classification system, called NOVA, was introduced in 2016. It puts processed foods into four different categories according to the degree of processing. This has allowed researchers to focus on the effects of eating foods from any specific category. Are you even worse off eating ultra-processed food than mere processed food? These are early days, but there’s some revealing evidence. . . 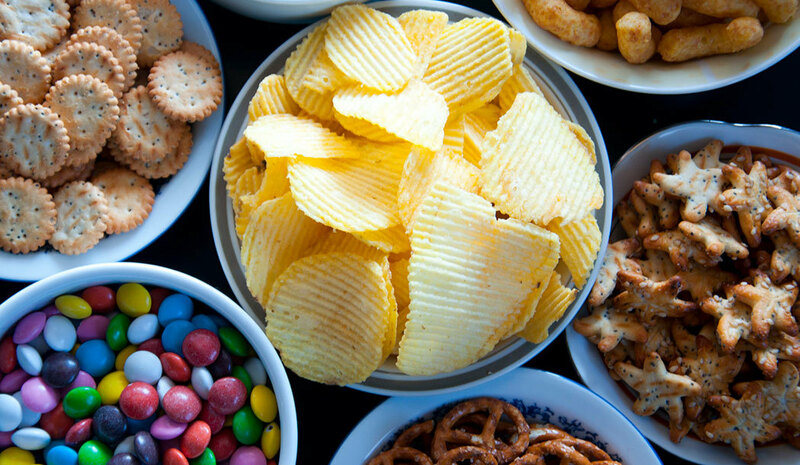 The few studies performed so far on the impact of eating ultra-processed foods have demonstrated higher levels of blood fats in Brazilian children and a greater risk of high blood pressure and obesity in Spanish university students. And earlier this year a study was published in the British Medical Journal that was the first to look at the link between ultra-processed foods and cancer. If you take an interest in your own good health, you’re probably aware that processed foods are damaging. The processing often removes or denatures important nutrients, and adds chemicals that increase the risk of cancer and other diseases. But because so many foods are processed in some way, dividing them simply into processed and unprocessed became unhelpful in understanding the effects the foods have, or in guiding national food policy. Some experts felt a more refined approach was needed, one that looked at how extensively processed the foods are. Unprocessed or minimally processed: Fruits, vegetables, whole grains, dairy, meat, poultry, fish. Can include processes, e.g. freezing, that don’t add salt, sugars, oils or fats. Processed culinary ingredients: Pressing, refining, grinding, milling, or spray-drying of group 1 category items. Processed foods: Simple products where sugar, salt or fats are added. Can include additives, stabilizers and preservatives. Examples are most cheeses; freshly made breads; canned and bottled fruits/vegetables/legumes; salted nuts; salted, cured, and smoked meats. Ultra-Processed foods and drinks: Industrial formulations with five or more ingredients designed to create products that are ready to eat or drink at once or merely need to be heated. Includes food extracts such as casein, lactose, whey, and gluten, and others derived from further processing such as hydrogenated or interesterified oils, hydrolyzed proteins, soy protein isolate, maltodextrin, invert sugar and high fructose corn syrup. Also includes dyes and other colors, color stabilizers, flavors, flavor enhancers, non-sugar sweeteners, and processing aids such as carbonating, firming, bulking and anti-bulking, de-foaming, anti-caking and glazing agents, texturizing agents, emulsifiers, sequestrants (preservatives) and humectants (moisture preservers). It would be easy to compile a vast list of ultra-processed foods. They include mass produced bread; cakes and biscuits; packaged snacks; industrialized candies and desserts; breakfast cereals; sodas and sweetened drinks; margarines and spreads, chicken and fish nuggets; pre-prepared pies; reconstituted meat products, instant noodles and soups; ready meals; ‘fruit’ yogurts and ‘fruit’ drinks. These products now dominate the food supplies of high income countries. Professor Carlos Monteiro and colleagues in the department of nutrition at the University of Sao Paulo, Brazil, where NOVA was devised, described category 4 as “formulations mostly of cheap industrial sources of dietary energy and nutrients plus additives, using a series of processes…[that]…are energy-dense, high in unhealthy types of fat, refined starches, free sugars and salt, and poor sources of protein, dietary fiber and micronutrients. To see if these food products were linked to cancer, researchers from the University of Paris (more familiarly known as the Sorbonne) examined data from almost 105,000 French participants aged 18 to 73, of whom almost 80 per cent were women. All supplied information about dietary consumption over a 24-hour period on three separate occasions six months apart, a schedule designed to cover different seasons and a weekend day. 3,300 different food items were included in the analysis. The researchers adjusted the findings to take into account age, gender, body mass index, height, physical activity, smoking status, alcohol consumption, energy intake, family history of cancer, education, menopausal status, hormonal treatments, fat, sodium and carbohydrate intake. After five years follow up it was found that a ten percent increase in the proportion of ultra-processed foods in the diet increased overall cancer risk by a significant 12%. It specifically increased the risk of breast cancer by 11% — a finding more likely to be significant because the sample included so many women. Those in the top quarter of consumption (a third or more of their diet was ultra-processed) were 23% more likely to develop any form of cancer compared to the bottom quarter (8% of their diet was ultra-processed). The top food groups contributing to the ultra-processed classification were sugary foods (26%) sugary drinks (20%), breakfast cereals and starchy foods (16%), fruits and vegetables (15%). I assume the last figure means the items were canned or otherwise processed, not fresh. Because France has a strong culinary tradition, ultra-processed foods only make up 14.2 per cent of foods sold (18.7% among the people in this study). However, even in France people have started to eat dramatically greater amounts of these foods. It will be interesting to see a repeat of this study conducted in the US population where four times as much of this kind of product is sold. In particular the study authors pointed to four factors to explain their findings. Poorer nutritional quality: Higher in calories, salt, fat and sugar, and lower in fiber, these foods also trigger a bigger insulin response and are less filling and satisfying, which leads to overeating. All of these factors have been linked to an increased cancer risk. Additives: While individual food additives may be below unsafe levels, the potential interactions among the 250 authorized additives is unknown. Lab studies point to potential carcinogenic properties. Other concerns include the negative impact of artificial sweeteners on the gut microbiome and carcinogens formed from delicatessen meat containing sodium nitrite when charred or overcooked. Heat treatments that form contaminants in products like bread, biscuits, fries and coffee. One of these – acrylamide – was shown to increase risk of kidney and endometrial cancer. The European Food Safety Agency classed this compound as genotoxic. Other contaminants with carcinogenic properties are heterocyclic amines and polycyclic aromatic hydrocarbons.